I am starting the new year with a solo show at the Astor Ruins in Astoria... this space is epic!! The many design elements of this crumbling hotel lobby will transport you back to the early 1920’s when it was built. My generous hosts have provided this space and will be making sure you feel cozy with lots of room to socialize, a warm fire inside by the couch, and food and drinks for the evening. Please consider hosting an event here, it is amazing for weddings and live music. The host can be reached for booking and questions at www.theruinsattheastor.com. The large space will be filled with floating tapestries of my local outdoor photographs taken in Washington and Oregon. On the battered walls you will find two sets of images from my early years of darkroom printing as well as my recent outdoor images. If you remember the Pixies album art from the late eighties, that was one of my inspirations for dipping into a style called “photo montage.” You will see layered back and white images with symbolic objects, like old railroad ties or rocks surrounding a photo within a photo. You’ll have to come see it if you’ve never experienced that style, and there’s a poetic story of love and loss behind it - it’s my first time showing these old beauties in Astoria. All my frames are handmade (by me) and are stately in substance, regal in appearance. You won’t want to miss this one night show from 5 - 8pm Saturday night, January 12, 2019 at 1423 Commercial St. in Astoria, Oregon. Cannon Beach Arts Association will be hosting a photography invitational show in February and March that will include many artists you have probably heard of who sell their work around the Northwest. Please come to this beautiful beach early and check out the tide pools at Haystack Rock. At low tide, Haystack Rock Awareness Program volunteers will be out there to help guide you through naming the creatures you will find and update you on the latest marine biology studies on local species. Join us for the opening on the evening of February 16 from 5 - 8pm at the gallery located at 1064 S. Hemlock St in Cannon Beach, Oregon. The show runs from February 13 through March 27, if you can’t make it to the opening. I will have several framed prints hung for sale. Aloha friends, Astoria take note! You know those old cedar wood floats that get around to half the places you know in town? Well I did a little project with the set designers of the remade television series Hawaii Five-0, which will be airing on February 22. They have not disclosed the details to me, but check out the scenes in that show and see if you can spot the old Astoria floats! The Hawaii-Oregon connection is real, from one end of the rainbow to the other. I need to see the islands sometime, but for now Cuba is in my sights! More about that later, or just follow my Instagram account link below to see my journey through four cities in the Western part of the island. The sky car pictured above is a great machine that keeps more soil of the forests undisturbed by dragging logs through the air. Long time, no see! Yeah, it’s been a rough summer, and I missed writing about some of my projects. For a couple of months, I’ve had the opportunity through a friendship to ride along with a log trucker and see what the logging roads are all about. Of course, the clear cuts look no more or less appealing up close and personal, but a 12-hour day starting at 4am showed me what it’s like inside of the second-largest industry in the state of Oregon. Logging ain’t what it used to be - it has come a long way through technology and scientific research to be safer for the workers and less disruptive for the environment. Lots of rules that protect wildlife and habitat are in place for private forest owners to follow, and follow they must. This includes leaving a girth of trees around bird nesting sites with special attention to threatened species, a buffer of trees along streams to protect salmon and trout, better road construction to prevent run-off (thereby keeping our municipal water sources cleaner), and a vigorous re-planting schedule to create new forest and leave a few logs and snags (dead trees) in place for wildlife habitat. One very interesting study performed by ecologists among Canadian Douglas fir trees was noted in the June 2018 issue of National Geographic (Vol 233, No 6), which proved through chemical tracking that older “hub” trees formed symbiotic relationships with fungal threads underground to send and receive stress signals due to environmental cues, such as loss of water, low photosynthesis sugars, or insect infestation. Nearby trees then send over necessary resources to help each other in a network, and this includes trees helping trees of another species! Clear-cutting and removal of the ancient hub trees destroys this connection and makes younger forests more vulnerable to stressors. Need any more proof that life on Earth is so very interconnected and dependent on each other to live in balance to survive? Loaders pick up logs as though they are toothpicks and stack them strategically onto truck trailers. Oregon is one of the best places in the world to grow trees due to climate factors. It is also awesomely beautiful. Sadly, we lost a lot of diversity in our forests with the removal of habitat and old growth, stunting chances for native plants to thrive in those areas. This is why I love going to the top of Saddle Mountain… there are so many wildflowers here that have not been disturbed and have the chance to play their symphony of color in progression from spring to summer to fall. With all of our continued research and progress in heavy machinery design, as well as saving protected areas that will never be logged, I hope that we can keep what treasures we have left while still providing good-paying jobs statewide in the industry. Being a lover of nature, I chose this project to stare in the face what I knew little about and see it for more of what it really is. Humans are industrious all over the world, and there are a lot of us. More people means need for more resources. However, word has really spread through all means of media about the damage we have done to our one and only planet through all of our industriousness, and our lifestyles and survival are each inextricably linked to the taking of resources… I hope the big guns in charge make better decisions in the future for the greater good of more people and more species than just themselves, including in the Amazon forests and every other struggling area. C’mon alpha males, be the good guys and not the bullies. We need you. The unloaders are massive! They grab the entire load of logs off a truck trailer and place them in the lumberyards. I witnessed an epic moment when the fighter jets flew into the frame. Getting out there and shooting brings knowledge, inspires quests for more answers, and sometimes brings unexpected spectacles that i am lucky enough to capture through my lens. After using a not-so-cute outhouse in the lumberyard, I put myself in place to photograph one of the unloaders and a diamond formation of fighter pilots flew right into my frame and through its jaws. Holy crap, that’s what I’m here for. Talk about the joy of my work. I have had the luck this spring to explore an area farther north of my home city and check out some really eye-catching geology in the form of rock erosion. Along the Chuckanut Bay there exist limestone and sandstone boulders, resting on the shores of saltwater beaches. What happens to these rocks from exposure to sea salt and acid rain is incredible! They begin to form little pits from weathering, and these pits become a honeycomb network of holes in the rock that are known as "stone lace." Stone lace, also known as "tafoni," is common in that area. I have hunted for it on the Oregon Coast and have found some at Indian Beach, but they just aren't as pretty, in my opinion. I do however come across some great basalt formations in Oregon, my favorite of which is "columnar basalt." It takes on a striking geometric shape of square columns. It seems bewildering that this happens in nature, and geologists have determined that their shapes were formed as lava flows quickly cooled, which contracted in a vertical pattern, forming rigidly defined columns. At Indian Beach, there is plenty of rock that has flat horizontal edges that look like steps, which are also developing vertical fissures over time as the ocean wears into them. If you like any of the images above in my blog, you can purchase them (and more) as fine photographic prints in my Etsy shop (HERE). 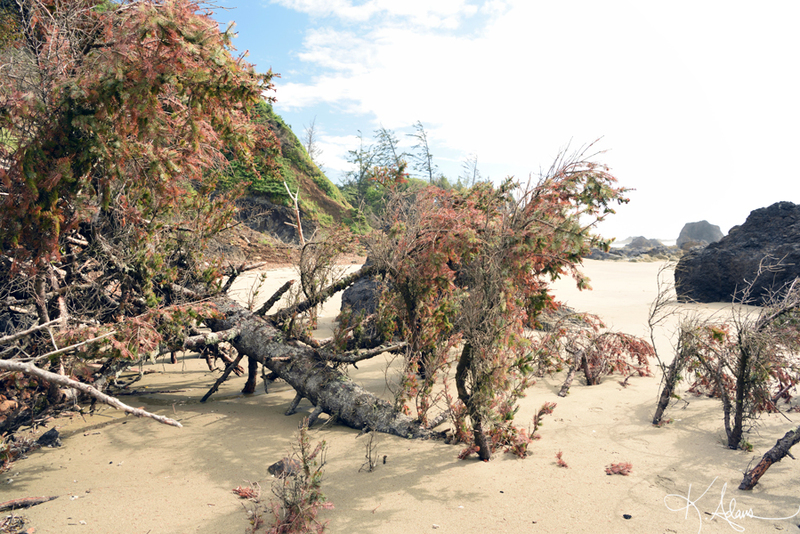 Erosion is not just a matter of sand displacement on our northwest beaches, it also affects forests on soft cliffs near the water. Entire swaths of trees and shrubs can fall into the sand below and become buried when their soil slips down the cliff-side. This makes for some surreal settings, like the buried tree pictured above. It is fun to find new vantage points when paths are opened up after an event like this. I get asked where I take my photos, and the answer is that I go to the same parks and trails that are available to everyone, but I forge new trails of my own and reach the edges of cliffs or climb boulders higher or farther out so that I can get unique vantage points. It gives me a great sense of adventure but it is also dangerous, so I don't take friends along with me when I attempt these things! Yes, that is a bit scary, but I follow my instincts and judge the terrain and weather to the best of my senses and don't ever go so far that I can't find my way back. For me, this is the essence of joy in my exploration of landscapes, and the ultimate prize that awaits me is what I turn into a photographic print that others can appreciate, too. This summer, Astoria Visual Arts will again host my work at a location (TBD) where you will be able to meet me and ask questions about my work, as well as purchase prints or home goods designed with my photos. I will have marble coasters, marble magnets, pillows, tote bags, and wood panels available for purchase. I am also happily taking custom orders for prints or products that you can arrange for pick-up at my table. Please follow this link to stay tuned on the tour map, when it becomes available: TOUR MAP 2018. Maybe you've wondered what my origin story is as a photographer. I, for one, am an "origins" person. I like history, genealogy, geology, and the timing of "firsts" and "lasts." It all comes together to make us known on a deeper level as individuals and as a people. Half of my lineage comes from northern France by way of Acadia, the other half comes from Sicily and Italy in the Mediterranean. Hence, I ended up with a funny shade of pale olive skin and freckles that doesn't tan well, and I'm only 5'2". The French came by boat to Acadia in the 1600's to be fur trappers and settle new land. These Acadians made their way to southern Louisiana through escape and expulsion after some unpopular rules were enforced by the British crown during their claim to these northern French lands by way of several wars. My ancestors from warmer climates came in the 1800's to areas outside of and within New Orleans that were already American. These two bloods, the Mediterranean and Acadian, mixed in the Deep South, where I became a known as Cajun. I began studying photography at the University of New Orleans in 2001 and was one of the last few generations of students before the digital wave, meaning every roll of film I shot was reeled in a pitch-black closet and printed under the amber light in a darkroom. I was one of the midnight warriors, making my way in the darkness to have the place all to myself late at night to make prints on silver halide paper. Only a couple of other determined warriors joined me at this time of day. I was on the slow path to graduation, working two jobs while studying with a goal of graduating debt free, and by 2005 I was only a junior at age 24. That August, Katrina sent us out of class and her destructive forces were the beginning of a really cool and empowering survival experience for me that began with swimming out of my front door in fins and towing my two roommates from India out with me on a Home Depot extension cord. It ended with me getting a plane ticket from Salt Lake City to Eugene as part of payment for working with a New Orleans record store's van that followed the Warped Tour. We set up big tents at each new city from Arizona to Utah. I stood outside selling punk chains and hemp necklaces, while the rest of the crew sold custom band t-shirts made on the spot under the tent. I had fallen in love with what little I knew about Oregon the year prior, having been a skateboarder and wanderer in a state where wandering meant you needed a boat to get to the best spots and skating meant riding pot-hole-ridden streets, giant oak tree roots lifting up sidewalks over 6 inches in some places, and absolutely no outdoor skate parks. So I took the chance to get myself out to Oregon on a "refugee" status that offered me in-state tuition to the University of Oregon in Eugene. Living through Martial Law was not fun, and I'm glad Oregon stepped up for us!! I was exited to head for a state that had rocky basalt cliffs and desert, all in one. At that point, I was getting around mostly on foot and by bike. I got my New Orleans bike as a rescue from a garbage heap in Baton Rouge on a family visit prior to the hurricane. It had a sweet custom bandanna seat that I designed and a Little Rascals sticker on the stem. Sadly, Buckwheat drowned in the flood waters, chained to my porch. When I got to college in Oregon, I borrowed a bike from my driving college roommate until I got Fiend. Fiend was designed by the Cadillac car company (strange, I know) and had some really crazy structure that only fitted BMX fenders, so I felt like I was on a half-motorcycle on the road. Oregon was more than the beauty I could conjure in my head. I knew I had come to where I wanted to be when I started to check out my surroundings between classwork. The sensations I experienced being around my first Northwest waterfall were of total relaxation and triggered some sort of animal sensuality. We were barefoot, we jumped from the top, we were free. Oregon became forest hiking, mountain climbing, sea cave exploring, and beach camping on the weekends with my house-mates. I found out beer tasted better in these places, but I still drank the cheap stuff a couple more years until I tried PNW craft beer. There were so many choices! After living here now for over ten years, I can say I've seen a lot of the Cascadian coast and hiked many trails, but I feel like I've only tapped into a tiny bit of the natural beauty it has to share with us, and I am so glad to live here with the purpose and intention of exploring as much as I can with a camera and bringing that beauty into our everyday lives. I live for those moments, being out there. And I am greatly satisfied when my image pleases you! Winter storms are nothing short of exciting here on the Oregon Coast. We are young and we are old... in geological terms. The Northwest coast of the United States is the newer edge of land on the North American continent compared to the Atlantic side, thanks to the slow force of the Juan de Fuca plate, Ice Age glacier movement, and volcano eruptions in the Cascade Range! While we are talking millions of years and many Ice Ages of lapsed time in terms of it being "new," the coast has been actively changing in dramatic amounts since our beautiful basalt boulders were hardened from magma on the shores of the Pacific, such as this Lion Rock on Arcadia Beach. Stormy weather brings in pounding surf and dramatic King Tides that bombard softer cliff rock called 'mudstone' which has a lot of clay and slips down in boulder-sized chunks. Thus our landscape is altered and different each time this happens, but it makes exploring fun and the discovery of fossils more likely! Just behind me in the photo above, I was standing on top of a finger of rock protruding towards the ocean away from a cliff that lost huge amounts of its content in a clean 'slip' down the cliff-side. The cove got smaller! Ask for a signed print from my studio if you wish. A proof will be on its way shortly, and the photograph will then be available on Etsy. April is officially my month at the Cannon Beach Art Gallery! Well, dang it, I've been a volunteer here for almost a year, and it is finally time I get a chunk of their real estate all to myself! Images of Washington and Oregon will be for sale at very reasonable prices till the end of the month. Your purchases here dually support my continued work and this non-profit gallery, which offers scholarships and grants to our coastal community, as well as workshops for hands-on art education throughout the year. 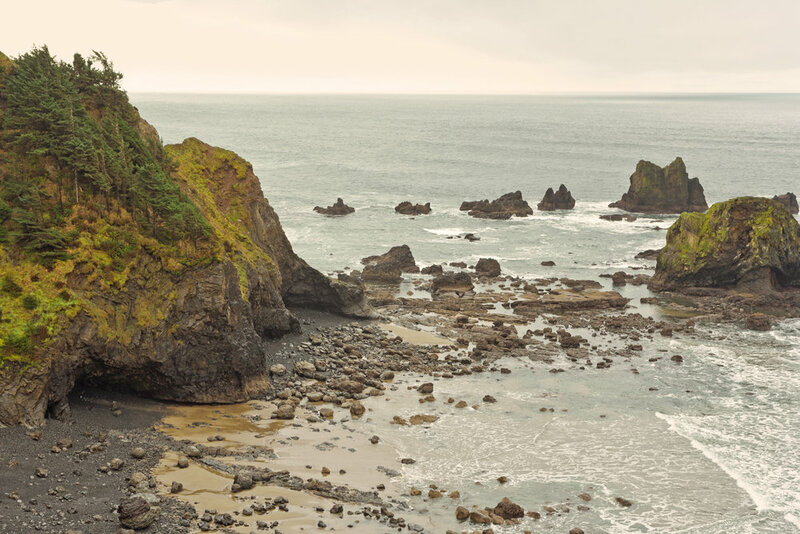 Just like we have our RAIN Magazine in Astoria, Manzanita produces Squid Magazine, a collection of poetry, prose, and art from coastal residents. Included works, such as my photograph 'On the Bellingham Tracks' above, are on display at the Hoffman Center for the Arts in Manzanita for the month of April. When you visit, you will see three large framed prints of my work for sale. Thanks for your patronage to this gallery as well, because your purchases support the continuance of my work as well as this non-profit community center. There's a new kid in town at an oceanic shop in downtown Astoria! Sea Gypsy Gifts is an immediate 'POW' of everything mermaid and seashells, as soon as you walk in the door. You will feel like nothing less than a sea goddess when you dangle their bangles from your wrists and twirl the driftwood, seashell, and glass chimes that hang throughout the store. The shop owner is known for her mermaid tail costumes that she makes on-site. I am happy to say that she will be carrying items that cannot be found in other shops in Astoria, namely the canvas Storm Water zipper pouches, 5" tabletop wood panel photos of local scenes, 5 x 5 loose prints to frame yourself, and vinyl magnets. Check her out for some of the most authentic beach gifts in town. After three arduous days of upgrading my decade-old Mac to be ready for publishing this blog, it is finally available on the Apple News app all over the world! It was a very long three days of getting to know my computer in ways I never thought I'd have to... but some things are just worth the struggle, and this was one. My blog will immediately publish on all Mac devices, including a desktop that is running on at least iOS 9. I cover the 'Get Local' portion pretty well, as I keep myself very busy here on the north coast of Oregon planning shows, running two online shops (Etsy and Society 6), and seeking out wholesale opportunities and commissions of my creative work. I'd like to 'Travel Far,' and for now that will probably just be Mexico, Canada, and other parts of the U.S. until I can afford more, so buy some of my work if you haven't! Do you think I'd get a great shot at Banff? Yeah, send me there with a purchase! Want me to document Costa Rica ethnic carvings in process? I do! Yep, buy a print or two from my shop! Spread the word to your friends and family that I produce fine quality landscape photography as my main focus, and send them over. I also give great service! This winter, the Oregon Coast felt some strong storm weather. On my drive south from Astoria, I witnessed waves and full-on ocean pounding right into the Arcadia dunes! This is normal stuff that happens out here, but it is still breath-taking to see places which are normally dry become inundated with water. What happens after all of this is we begin living with a dramatically changed coastline. Each shot I create of the same area will be different from then on. Loose soil slides down basalt rock into the ocean, and trees fall in every direction like pick-up-sticks. Small dark boulders tumble and pile on the sand as the softer, lighter sediment is washed away in the following tides. And thus every year, we have a new beach to admire and some to miss. My last hike was at Ecola Point, just north of Cannon Beach (famous for the Haystack Rock where puffins breed). The trail was a fun and challenging one that took me through deep grass and across a fresh stream, and I dared myself to go to the wide part of the bluff by hiking a narrow path of dirt above a bush whose roots were exposed and hanging off the cliff-side already. Well, I took my chances to get this shot, and it was worth it! The print will soon be available on Etsy, and my first proof looks so dreamy in person! I would like to formally invite you to reach out to me via the Contact page and visit my studio! I handle this by private visitation only, for those who are interested in purchasing some of my work. If you are in the north coast area and want to see the prints and products that I have on hand, you are welcome to arrange that with me. Thanks for all of your support! It helps keep me going on this journey to bring the outdoors into your home, so that you can revel in the beauty of our beautiful earth when you are in your sanctuary away from the craziness of the world. And please leave a comment on my site. My blog feels pretty lonely there without you! Hey hey! Well if you haven't heard yet, there is a new event on the coast for female business owners to showcase their work and talents. Come to the Seaside Convention Center this Sunday to hear about the goods and services that are offered on the North Coast of Oregon. You will discover hidden talent! Follow this link to find out more: OCWE. I will have a vendor booth with lots of my landscape photography and photo good for you to purchase and ask about. You will be able to ask me questions first-hand about custom tailoring of my product lines for your event, wedding, or business. My work is available for wholesale, and my images are available for licensing. If you are in Astoria, you can view my current two month show, which will be up through the end of March. Hanging there are several large framed prints of my photographs, as well as some smaller photo wood panels, marble magnets, marble coasters, and tote bags. All are for sale and available for you to take home immediately with payment! Lastly, if you are a retailer or hotel, send me your contact info via my Contact page so I can get you on my wholesale newsletter! Anything you could want to know about my products and their pricing is there. If I could make it my job to play outside all day... I would. I'm trying. I suppose the best moments in my process are when I am discovering new vistas, soaking in the details, and wondering in awe over the geological clues of our very existence, present namely in rocks that I can observe with my naked eyes. I am no scientist, so I don't do air samples, core samples, water samples.... I'm no Ansel Adams with developing equipment in the back of a van, so I'm not gone weeks at a time making prints on the road. I just use my two eyes and dig into my curiosity using all the resources made available to me by scientists, researchers, and practicing photographers to do what I do and learn about my environment. It is a great, joyful method for me, and the real fun is in making a satisfying print that represents a place and becomes a definition of "place." That's my only job I give myself. I then share this with others in the form of products I design and traditional wall art, hoping that my images of the places you live in become the "spirit" of objects when you invest in my work. Funny thing that I realized on a recent hike where we took the wrong entry and ended up at the beach... is how temporary most of our landscapes really are here on the northwest coast! I took a trip to circle the entire Olympic Peninsula in November and later learned that that region is relatively new land on a geological timescale! This made me think more deeply about rock formations, and I love to look at rocks and even collect them. Well, on the more recent beach hike, which was actually a failed Cape hike (silly me, I led the expedition), I noticed something in the heaping cliff-side that rose high above us on the beach. A sediment layer of blackened everything - blackened soft sediment with hard rocks falling out and blackened tree roots. I looked up at the forest on the hiking trails, meters and meters above me, and noticed a living tree barely hanging onto the precipice, which was perfect for observing root length - they didn't go very deep! What this made me think was that the roots of the tree that I was looking at at my eye level had been buried by new sediment and were very old roots! I guessed first that maybe there was a fire and an earthquake that made this chunk of forest slide down into the ocean and turn black... had to wait till I drove home to do some research. Well, I found two articles written about an area just a few miles up, as well as another Cape farther south, and I was onto something! It turns out that Oregon's sometimes extreme tidal erosion, of course, was responsible for these roots even being visible, but what was even cooler to learn was that landslides did in fact occur here, exposing "paleosols" (ancient soil deposits) with well-preserved tree trunks in just the right conditions. Scientists believe that these landslides occurred during a previous Ice Age, and just up the coast, similar preserved trees were carbon dated to over 38,000 years old. OMG! What a find! I got to touch them. I saw similar dramatic beach erosion when I lived on the southern coast of South Carolina in my early twenties, and it seems I find myself still attracted to some of the same things. Over the winter, the thought of doing Spirograph designs crept into me, and I went for it head on! It was fun to reconnect with a childhood "toy"... or really an engineer's "drafting aid" is what it was meant to be. These were originally designed in the 1880's by a British engineer, and they soon after were marketed as a toy! Boy would I love to see one of those, if I ever got to search some old attics in England! I drew spiro designs that stand alone on my newest handmade coasters and magnets, and I have just begun to incorporate them into my landscapes, too. I'm pushing out my first "test" designs of the mixed mediums on Facebook (here), and we will see where this goes! I'm curious to hear feedback on these designs... what do you think? Would anyone want them as record covers? Art prints? Pillows? January through April will be months for lots of social networking time, if you'd like to discuss my artwork in person. I will be showing for four solid months in Astoria, OR at Good to Go in January, at Three Cups during February and March, and at Cannon Beach Art Gallery in April. THEN it's time for spring shooting, so exciting! I am also releasing my first wholesale newsletter-slash-catalog in late February, so if you are a retailer, gallery, hotelier, or business interested in adding my design products to your retail, go to the contact page and let me know with a quick email! I'm happy to do custom projects with my designs and photography. As always, my work can be found on ETSY. You can contact me and follow my latest using Facebook or Instagram. Woohoo -- new things are here! A late acceptance into my first Washington Coast holiday market at the Adrift Hotel this winter inspired me to really go for it! I created three new product lines in three weeks, from research and development... to actualization. These handmade two inch square magnets are the cutest small expression of my work so far. Each keepsake is made with one of my Pacific Northwest images that I transfer by hand onto marble. I chose very strong rare earth magnets so they stick to your fridge or vintage locker or whatever you put your magnets on! I hope these put a smile on your face every day... let art make a friendly invasion into your life and lift your mood on these grey days. Hey, keeping the positive perspective of having something to always be grateful for is a must in life, and we are so lucky to have such beautiful surroundings to live and thrive in. Magnets will be available in themed sets in my Etsy shop soon. And no less satisfying are these matching marble coasters! I make these the same way as the magnets, and each four inch marble slab has its own unique character which it imparts to the image. I have a catalog of over 100 images to work with, from scenic landscapes to cultural icons. Cannon Beach Art Gallery will be the first to carry coasters, and you can find my magnets in Astoria at the Riverfront Trading Company. I tested these puppies out with hot coffee mugs and sweaty beer glasses, even gave them a good clank or two, and they survived just fine. Each magnet and coaster has a double coat of protective sealant to last you a long time. These will also be in themed or matching sets in my Etsy shop soon. Holler if you want a set of something, I'd be happy to make them for you or your business! Road Tripping the PNW Coast, Holiday Market in Long Beach, and Four New Photo Product Lines! How can I even begin to tell you all how much I am enraptured with this new camera?! It's as though it sees what I see... finally!!... it's my "mechanical eye." In fact, I think I will call the wide angle lens my "black eye" because it can see so well in low light settings, which we know the north coast for having as its default weather. There are all kinds of great features I invested in that allow me to take clear shots of the landscapes I explore... and sometimes I even get lucky when visiting these terrains to happen upon some if its wild locals, such as the juvenile red-tail hawk pictured above, taking off over the Columbia River on Thanksgiving Day. I'd be honored to share my photos with you through social media on Facebook and Instagram. This NotYourEverydayDreamer site is a great resource for viewing my portfolio and reading the directions I am taking via my blog, but the day-to-day grit will be posted more frequently on the other sites. This event takes place on Saturday, December 16, 2017 from 10am to 4pm, downstairs in the little side room near the lobby. There will be clean bathrooms, fresh hot coffee, and an upstairs dining room called the Pickled Fish for you to enjoy if you come out for the day to shop with me. What a great place to catch the sunset, up in the Pickled Fish! I have been busting tail here in my home studio to introduce four new product lines in a month's time. Am I crazy? Crazy-inspired and persistent, yep. These new lines will range in price from $4 to $50, all being small gift-able items for yourself or a loved one. This means they will be easy to ship, too! All of them will incorporate my coastal and forest photography, and I'm gonna make you come and check it all out before I spill the beans too soon. Please come on over and say hello, I would love to talk to anyone interested in my work! I enjoy sharing local knowledge and stories about this beautiful land we call the PNW. Here is part of my philosophy as a creative. I've heard of some artists going only after big projects... but I believe in everyone being able to afford art in their lives. It makes art more prevalent, influential, and visible. By making small affordable art that is functional as well as decorative, art can have a larger presence in our lives, and we do not have to settle for chain store, mass-produced stuff. Think about how many art pieces you own that are worth more than $120 each... probably not many. But how many creative magnets, cards, small prints, bags and other small things do you have that enhance your daily life because you are able to enjoy the inspiring, creative, local imagery artists have put on them? Exactly! Here's my Instagram again if you want to follow along... I just might post a few photos of my new stuff the week of the holiday event. You just never know. Direction, Purpose, and Instinct. Just.... Yes. It's hard to not get all warm-caramel-goopy inside when I think about where I am at in my art direction right now. It's like "wow, I just woke up, and here I am doing this!" Well, my idealistic thought patterns can often leave out the ride-along hardships when I finally reach a new pinnacle from my efforts. But the trick is, there is always another pinnacle! So I keep ending up in this place again and again, and the effects on my psyche have been amazingly positive. Lately, I have done some day-tripping with my new fancy glass. I drove the entire Olympic Peninsula in two days, fell in love with a Victorian seaport town, and returned just a little defeated from not having correct filter sizes for one of my lenses. I faced the nervous challenge of being totally new at a very advanced device that came with a 500 page manual (I sat and read the whole thing before it even left my house!). But, I give myself grace because this is all so new and amazing, and I enjoyed meeting so many nice, curious, supportive people along the way. Washington, you are one Laid-back state. When I step out my door, sometimes I even wonder what I am doing -- I think this is a factor of the newness of everything and putting my old gear up for sale, so I'm letting go of comfort I have known. The challenge of being completely alone with my thought processes is panning out into gain -- I have greater understanding of myself. I realize, "Hey, it's all okay. You just gotta do this your way. Nobody's rules or expectations apply." I faced a fear, put the big bucks down, and now this ship is sailing and I'm the captain, wooo! And just like a captain, I am on top of the weather, the road conditions, the hazards, the tides... I feel more connected to the earth than ever before. I keep going to sleep at night hoping for another day to do this. One thing you will never hear me say is, "I'm bored." I suppose this November writing is more a heady thought-release for you to peer inside the workings of my mind as an artist whom you may follow or even admire (I'm honored if you do!). Maybe you could see that the results from going beyond comfort, facing fears alone, and following your gut is all good in the end. For myself, I'll never have to wonder because I tried. There's Lots more to come this winter, as I just taught myself a budding new skill in the arts. Can't wait to blog about it later! My work is for sale through Etsy and Society 6, and you will find many links throughout my site here that will take you shopping if you find a print that you like. I recently added two new 'Galleries'of products and prints here to get you stoked on my work and start looking at more. I also re-vamped the whole look and organization of NYED, and I hope you enjoy the new layout! Well, if it didn't take a decade, I finally invested in a professional full frame camera. C'mon already! And in that process I learned some great advice for independent creators - first, don't take it outside until it is insured, of course. "Scheduling" a specific professional item such as a camera is the way to go! Scheduled items are protected through your insurance company outside of your annual deductible for a small additional cost. In return, you get world-wide life-long coverage as long as you own it. I highly recommend doing this for any other valuable tools you may own, too. Having a full frame camera is so exciting! It's not the brand that matters to me, it's the better quality of lens construction as well as the option to get everything I see in my "vision" in the full frame when I take the shot. I have been operating on "crop frame" sensors for the past decade, ever since the time I shot on 35mm film in college. I'm so excited to do some island-hopping in the Pacific Northwest for some killer shots and serene soul-quenching experiences. Here is a mini slideshow of a few of my newer prints that I have released on Etsy tonight (click here to shop). There's so much inspiration in my surroundings that I'm sparked with ideas every day, but I couldn't chase them all! That's part of my favorite aspect of the beauty of working for one's self ... you get to create the vision as you go and see what draws you strongest. It's an invigorating experience of getting to know yourself better, as well as seeing the world around you with completely different eyes! In the medium of design (since I do photography as well as product design...), I took a course through Sitka College of Art and Ecology over the summer and learned to make patterns. This is exciting because patterns can be applied to so many things, beyond even the printed image and cloth, which are probably the first two surfaces that most people think of when they think of "patterns." I can already think of an application where the pattern is not being used, and I've done market research on it... things could explode! Here is my first one, titled "Baja Breeze," which has elements from my trip to Mexico last winter. And if you are wondering, that's a bottle of Pacifico, not Corona! So stop drinking Corona already - Pacifico is much better! My design is already available on a variety of products, including floor cushions, rugs, coffee mugs, zipper pouches, and more over at Society 6 (click here to shop). It's been fun to play with! This image was originally created as a pencil drawing, then arranged into a pattern and carved onto linoleum, hence the handmade look. The knowledge I gained in that class blew my mind! I felt like I was learning some "ancient secret" on how to make patterns. Speaking of which, is anyone out there interested in taking a class from me this winter? I have a few topics in mind that I'd like to teach, namely, how to put your art on products as well as how to market yourself on a budget. Please use the Contact page HERE to give me your name and email to put together an idea if there is interest in learning. Thanks for reading my blog! I hope you learned something or were inspired, or maybe you'll even want to buy some of my art over in my Etsy store, who knows! Please "like" this blog post below to let me know I have readers out there. Hello curious readers! I've been so busy this summer and want to fill you in on some of my current projects and directions in art and design. I stepped out in a big way (left my day job) over the spring, and I am happy to say I have been working full time at art ever since! I'm never bored, that's for sure! Adventures are for creating, and projects always seem to find me or I find them! This summer, my design work got discovered by the Playa Largo Resort in Key West, Florida. It started when I began collecting vintage cedar wood floats that were made right here in Astoria, Oregon in the 1950's. You know, the ones that were used before plastic and styro-foam became a big thing and formed the big mass floating in our sweet Pacific (ugh). The resort has been asking me for them, and I've been dutifully refurbishing them and even shipping them off just before and after the big, destructive Hurricane Irma. Don't worry - the resort fared well since they are one of the newest structures on the island, and building codes there require greater resistance to the forces of nature to lessen the blows that seasonally arrive. I'm excited to say that my project has become a signature part of the resort's design! And Playa Largo Resort is one of the Marriott's "Autograph Collection" of boutique hotels. Yes, that certainly feels a bit fancy for me. Back in our Oregon Coast paradise, I have been busy working with several Astoria shop owners to increase the presence of my work on the retail scene. This comes after months of art scene business, doing solo and group shows of my work. I was asked by several shops to supply my photos on postcards, and so far they are loving them! Thanks, you are helping me survive out here in this old city. One of the shops where you can find my stationery cards, postcards, mini wood panels, and a few refurbished floats is the illustrious Luminari Arts! These shop owners are killing it in the card and unique gifts departments. I am so excited to finally be in there! You can find Thailand-carved wood decorations, folksy northwest fish paintings, crow stuff, and more. I could spend at least 30 minutes there just perusing their vast, humorous, and creative collection of cards! Several other shops carry my other different stationery cards. Each shop has a unique selection, so you have to look around to find them all. I'm not letting any one shop bogart the postcards though - we artists have to do what we have to do to get our work out there, and sometimes that requires buying stuff in bulk quantities. A few of these places where you can find my coastal tote bags, postcards, and cards are Old Town Framing Co., Maiden Astoria, The Astoria Column Gift Shop, Buoy Beer Co., and the ever-fun collection at Riverfront Trading Co., aka Coldwater Skate and Surf (reborn). Well, as far as the near future... I hope and pray I get invited to Key Largo to check out the wares I'm shipping down there. I need a break for real! Sunned freckles, reggae music, Caribbean breezes, and white sand would do this girl some good! This winter will be a good time to hunker down and create new work while pushing existing work into the hands of many, and as always, looking for new art and design opportunities. I don't plan on doing a northwest winter ever again without staying in a warm locale for at least a couple of weeks, now that I have found out how much cheaper winter flying can be! Well when they say put yourself out there... I got as much as I can handle, and more keeps coming just as soon as I push another project or show to completion. This is really an amazing process, and I know the flow will happen in its own way... I hope I can handle it and still find time to cook and sleep! Yesterday, I hung a show at the new BOLT Coffee Bar in Gearhart. This spot is a quick and easy stop for a road adventure coffee, located on Highway 101 near Pacific Way. The owner, John, has had a passion for owning small businesses, and this coffee bar is his new venture. He serves Oregon coffee (with s'mores additions!) and has a wall of my wood photo panels on display. There are some larger prints framed in decorative pine, too! Really, he is using my work as shop decor, but I'll let it pass for awhile. The show will run for several months, and plan on a fun gathering for a grand opening later in the summer! Farther down the coast, Cannon Beach Art Gallery at 1064 S. Hemlock Avenue is now carrying several of my smaller wall and tabletop 5 x 5 mini wood panel photos. This is where you will find the Haystack Rock photo, of course! You know... that gorgeous sea stack over 15 million years old that everyone checks out for nesting puffins on top and the tide pools around its base. Stay tuned for future adventures and new art prints that will become available! My shop is always open at https://www.etsy.com/shop/Sweetsere. KALA Hipfish Gallery Opening, Summer at Reach Break Brewing, and July 'Open Studio' in Astoria! Things are rolling along with lots of road trips and new landscape images, and I can't really say I'm ever bored working for myself as an artist! It's been ten weeks since I struck out on my own, and I actually paid rent last month... can you believe it! Click HERE to begin following my Instagram for adventures and art projects. Click HERE to shop my newest designs on Etsy. This Saturday, July 8, is Astoria's own Second Saturday Artwalk. I will have two walls in a group show with a few other local artists at KALA Gallery at 1017 Marine Drive. Artists will be there in person from 5pm to 8pm. They have a mini bar and a stage for live music. I'm showing a collection of north coast Oregon and southwest Washington photographs on wood panel, and as a special treat, I'm pulling some old paintings out of the vault! I recently began painting again after about 8 years absence doing other things, and I finally got back into it! So there will be these two new 'Succulent Mandala' paintings to add to the older works from 2009. Summer is happening, and Reach Break Brewing is generously hosting my work in a long extension. It's been really fun finding out which pieces sell and to whom they now belong... I like to get to know my fans, so don't be surprised if I look you up on social media with a friend request after you have purchased a piece! New works are added each time one sells, so it's always freshened up. July 29 thru 30 is Open Studio (event map to be posted soon), a huge artist event in Astoria, which I am participating in this year for the first time. HiiH Lights barn in the Lewis and Clark area will be hosting me along with a bunch of other artists... this should be fun! I'll have a new tote bag display I built recently, so lots of totes will be for sale. I'll also have a few pillows with my designs, as well as some zippered pouches, my last few sets of the limited edition cherry wood 'Astoria Storm Drain' coasters, and a slew of mini desktop wood panels set on my table with some larger wall-hanging photo panels. Oh yeah, and I guess I'll tote down my painted rock collection for gifts under $20! Most of my work will range from $25 to $80, and I'll be able to take cash or charge on my new Square card reader. There's lots more to share in the future about some upcoming shows, but then this post would be even longer, so I'll save that for the next one. Come say 'hi' at any of these events or venues! My my, it's been a busy month! I got the balls rolling in a few directions, and they seemed to have fallen into deep prolific canyons of adventure! Every summer in Astoria for the past six years, our esteemed Astoria Visual Arts (AVA) group has welcomed and encouraged visual artists to open up their studio doors and gather collectively to show and tell about what we do (and hopefully make a little money and new fans in the process!). This will be my first year joining a bunch of artists at the HiiH Lights Gallery/ Barn in rural Astoria. I will have a table full of my photographs and designed goods to show you a spectrum of my work. As with other artists, I will be there to talk about my creative process and hopefully get to answer some mind-expanding questions from you all that will help me learn even more about myself and my community! AVA is currently building their page for this year's included artists, and we will know very soon, since deadline is May 15. For now, HERE are the current AVA members. Secondly, I entered one of my screen-prints into a group show themed 'Text + Image' with the Cannon Beach Arts Association, and I came away with great news as well as an opportunity that has got me super excited. They did accept my piece into the show, which is up through June 12 at their gallery at 1064 S. Hemlock St. HERE is a link with more info about the show. I missed the opening night due to a really rocky, late plane landing in SLC ... let's not talk about it, or I may get queasy again. Best thing is, I was asked by a gallery docent to join their team of volunteers, and I start next week! I have been pushing myself farther in the direction of art since I left my day job a month ago, and I am so excited to be able to learn the ropes of gallery sales and representation of other artists. I get all starry eyed when I think of all the great stories and histories I will get to learn about each individual and their creative processes. Plus, the gallery shares the building with a popular local coffee shop, and it can't hurt to have espresso when expressing my enthusiasm for art! At home in Astoria, Reach Break Brewery has extended my coastal photography show another month, and I've been super grateful to have sold a piece just about very week. They have extended their business hours to five days a week now, and the sun is coming out, so it's time to go on over and check out their beer, the food carts, and my art if you haven't yet. All pieces are under $100. Artwalk is Saturday, May 13th from 5 to 8pm. Just when I'm busy making headway in one artistic direction, life presents an unexpected use of my skills that hopefully opens up more doors of opportunity. Over a year ago, I was approached by an Olympia, WA band to help them with the design of a large cloth tapestry that they wanted to hang as a backdrop for their live shows... I had honestly not thought of this, and was like, "Wow, that's a really good use of these huge cloth prints!" I hope you enjoy the following interview I did with Robert and Shawna of Birds of a Feather about their imagery and ideas behind the design of this tapestry we collabed on. Robert and Shawna, you travel as a married singing duo… do you mind sharing the story of how you met? We met at church, we were 15...I remember Shawna flirting with me...she was untying my shoe. Her eyes looked up at me, so beautiful. How did your band ‘Birds of a Feather’ come to be? Our name originated in a song I wrote for Shawna, the song was called 'Be my Marie' (named after her middle name). There was a line in it that said, "birds of a feather, crash together." We did a Vaudeville show seven years ago and we needed a name; Shawna remembered the line from the song, and since we both loved ravens and crows, it seemed like the perfect fit. We truly came together as a duo during that Vaudeville series. We played 6 nights in two weeks. It really brought us together as a singing duo...a much stronger bond musically. Trusting in each other night after night with only our voices and a guitar. What kind of things does your band like to accomplish with its performances? There seems to be an emotional response you'd like to illicit in your choice of performance attire and dramatic black eye make-up. Our goal is to be able to help people feel something, to be touched emotionally by a song, melody, or our love for each other. The "crow" and the "raven" are a symbolic part of your band imagery... what do they mean to you? Both the Crow and Raven are very intelligent birds which intrigue us very much so. They have a language with each other and can also be taught to speak actual words. As for the black eye make up and attire, that came from the Vaudeville shows. We were trying to find a twenties look... back then men and women wore very dramatic make up for performances, so it seemed perfect for Vaudeville... so it stuck after that. Plus it does work with the whole "bird" theme. You've mentioned the city of Astoria is one of your favorite places to play... what about the area attracts you? How do the visual vibes of the 1920's urban architecture and the surrounding county lands move you? Astoria was a place we fell in love with back in 1998... we first visited then on our honeymoon. We stayed a week and fell in love with the beauty of the city and the people. We someday hope to move to Astoria. As for the 20's building structures... well that makes a full circle with our love for the 20's art and style. Got any interesting hobbies outside of music you'd like to share? Music is our true joy, it's something we focus on. We love photography and might take up painting soon. These two lovebirds also enjoy working together at a famous northwest coffee roaster. So if you are in Olympia, I should mention to stop in for a great cup of northwest coffee at Raven's Brew, creators of the famous 'Deadman's Reach' dark roast sold on Amazon. Just don't try to push the human limits here on your dose... according to an interesting fact from the roaster's website, 100 cups of coffee in succession will in fact make you a dead man! On another thought, they also mention that the coffee bean originated from the same Rift Valley area of Ethiopia, the birthplace of humans! So it's perfectly natural to partake of this gift from nature... I imagine it helped our early ancestors outrun a hungry lioness or two. For a look at more tapestries I have designed, you can view the Product Design portion of my website. Many of my existing photos of the north coast can be made into tapestries for your home or creative use, and you can find a few for sale in my Etsy shop (click here). Well holy boilin' grains, Reach Break Brewery is open and the beer is flowin'! Lucky me, the owners (Thanks, Finn, Josh, and Jared!!) have tagged me as their inaugural artist to show my work during the February 11th Second Saturday Artwalk, held in downtown Astoria, Oregon. These guys have founded their establishment on a love of the outdoors, and I believe this is going to be a favorite spot for many outdoor enthusiasts who want to cruise through the open parking lot this summer, when the inviting smells steaming from food carts will float around the block and the sour beers will be flowing inside. I will definitely be there! There aren't many things better than having a pint outside on a sunny day in the oldest American settlement west of the Rockies, except maybe having one in the forest on an Oregon coastal trail (Or Mexico). And Please recycle if you do! They make the whole carry-in, carry-out routine easier with their ability to give you beer to-go in a 32 oz. can, made for you right on the spot! Going out on a chilly day? They've got sweet hoodies, too, with their water-centric Blue Reach Break logo! The art displayed will be from a selection of my coastal photography from the past five years of calling this place home. You will be able to view photo wood panels, a couple of larger fine art prints, and coastal/Astoria photo tote bags. You may take home your purchases same day, as I've got more to put up as it goes! Price range is affordable, from $25 to $120 for art pieces and $34 for tote bags. Please inquire about custom work or other prints you see on my website that you may be interested in. Here's a small click-through gallery below. Ok, so I really hope at least five people give this page a little heart by clicking below, because damn, the internet loading speed today was about like getting 25 kinder-gardeners to put their little wrists in a rope line and getting them through a door to go inside....I'm gonna need one of those beers soon! Or better yet, tequila in Mexico again. Say hello at the event from 5 to 8pm on Saturday, February 11, 2017. Hotel Linen Design on the Long Beach Peninsula: Meet Adrift Hotel's New Pillows from My Studio! The time came last year to search past my local home of Astoria for opportunities in design and retail, by re-discovering our sister region, the Long Beach Peninsula of Washington. Here is a place that has that feeling of "otherness" in being separated from the mainland cities and yet having its own laid back vibe, retro eye candy, and closeness to nature. It's a gem in my book! Lately, there have been a lot of my projects in the works - preparing to be the inaugural Second Saturday Artwalk artist for a sour beer brewery opening this month in Astoria (yay, more beers! ), working with Buoy Beer to create a new tote bag design for 2017 (see last year's design here), re-stocking the extremely popular Astoria Column gift shop with local goods (totes inspired by Coxcomb Hill), and forging a relationship with the local Astoria Riverfront Trolley Association to sell trolley photo totes (see here) on one of the best things in town - a sight-seeing vintage ride along the Columbia River with friendly information guides for only $1!! The vision of the owners and designers of the Adrift has really struck a chord in my soul, as I noticed we are attracted to the same colors and hues of blues and greys, with dashes of red and fun lighting among their minimalist design elements. Exposed wood grain furniture and grunge-textured metal panels add earthiness and warmth to the cool colors that are known for their subdued and calming effect, much like the peninsula skies on a typical day. Each room has its own unique personality, with vintage lights casting prismatic sparkles that frame the beds, which kind of make me feel like a VIP visitor. Relaxing softly on the fluffy beds are my accent throw pillows they chose, which really bring the outdoors in by being a tribute to what you see out the windows at your cozy sitting tables - foggy forests on an overcast day to the East and South or sunny sand dunes on brighter days to the West and North. This is a coastal landscape that is gifted with beauty in every direction ... it's part of the charm of not having any skyscrapers around! I really had a hard time leaving without taking lots more photos, so if you want to go check it out and stay yourself, visit Adrift Hotel (here) for booking or just to satisfy your curiosity. They have great winter rates and provide self-contained entertainment in the form of foosball and ping-pong tables, and they will exceed your basic survival needs with a wonderful bar and restaurant on the top floor called the Pickled Fish (here), featuring live music every week. You won't be complaining when you have the free locally roasted coffee in the lobby either, winky-wink. I am open to designing custom pillows, wall tapestries, and tote bags for more local businesses who enjoy my style of photography, but if you want one sooner than later for your home, there are quite a few I can ship out from my studio. Shop online for them at ETSY (here) or browse my page of Product Design (here) from my website, NYED. Wood is Good: Photo Art Panels! The time came last winter to diversify and try a new method of art display. I can say I'm pretty dang happy with not only the way these lovable panels turned out, but also with the lower cost of making them (and less materials required, too!). So that means more affordable art for you, and more love for the planet's resources. And more simplicity for me. It's a win-win-win, and that's how I like to roll. I finally have had the time to try out lots of images, through displaying them at a local art show covering Oysterville and by listing them in my Etsy shop (Sweetsere), and the time has come to proudly add them to my Product Design repertoire as well. I think it's a good method, and I'll probably keep this up for future photos to come. Be looking for a second art show announcement this year with more of these Astoria-oriented photos on display. Here's a few you can now find on Etsy.